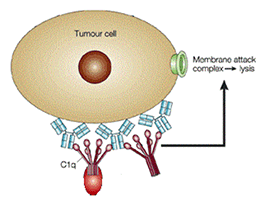 In order for the complement cascade to be activated, the circulating complement protein C1q must first be recruited to the cell surface by the bound immunoglobulins on the tumor cell surface. The initiation of the complement cascade leads to the downstream formation of the membrane attack complex. The membrane attack complex forms a pore on the cell surface and thereby permeabilizes the cell membrane which leads to cell death. 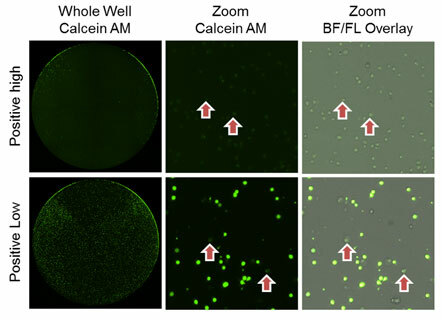 By staining the target tumor cells with cytoplasmic dye calcein AM, we can monitor cell death by examining the retention of calcein AM within the cell. Only live tumor cells with intact cell membranes will retain the green dye and while the dead cells will release the calcein into the surrounding media. Based on the retention of the dye the Celigo software can enumerate the number of live target tumor cells over time. By observing the reduction in target cell number over time we can determine the percent cytotoxicity for the complement dependent cytotoxicity assay.